In this lesson, you will be introduced to options trading basics. You will learn about the different types of options and how they work. This is a very important lesson as you will need to know what kind of options exist and other basics for the upcoming lessons. Therefore, please take your time and go through these options trading basics carefully. Rather go through certain parts multiple times than continue without understanding everything. If you prefer video over written articles, I suggest watching the video above. In it, I cover the same lessons as I do in this written article. For the best learning effect, you should watch the video lesson and read the following article. There are two main types of options: Call Options and Put Options. Call options give their owner the right to buy the underlying asset for a certain predetermined price. The owner of a call option usually hopes the price of the underlying asset will increase in price as he then can buy this asset at a discounted price. But note that the call option’s owner has the right and not the obligation to buy the underlying asset. If he is not interested in owning shares of the underlying asset, he does not have to buy the underlying asset. Put options give their owner the right to sell the underlying asset for a certain predetermined price. This means the owner hopes for a decline in the underlying’s price. If the underlying’s price decreases in value, the put option owner would be able to sell the underlying asset for more than it is sold for on the open market. But again, the put option owner only has the right to do this, meaning he is not required to do so. Buying options is also known as ‘going long’. Besides buying to open option positions, you can also sell to open an option position. This is also referred to as ‘shorting’ or ‘going short’. There is a significant difference between buying to open and selling to open. Option sellers (also known as ‘option writers’) don’t have the right, but the obligation to buy/sell shares of the underlying asset if the option buyer chooses to exercise his right to receive/sell shares for the predetermined price. As this is the case, option sellers don’t have the same directional assumption as option buyers. A seller of a call option wants the underlying price to go down and a seller of a put option wants the price to go up. Christian buys a call option on the stock XYZ. Thomas sells this exact option to Christian. As Christian bought the call option, he has the right to buy a certain amount of shares of XYZ at a predetermined price. If Christian chooses to exercise this right, Thomas won’t have a choice. He will have to sell shares of XYZ to Christian. Christian wants the price of XYZ to go up so that he can buy the shares at a lower price. Thomas however, wants XYZ’s price to go down or at least stay the same so that it won’t be worth it for Christian to exercise his right. Emily chooses to sell a put option on ABC and Oliver buys this put option. Now Oliver has the right to sell a preset amount of ABC’s shares at a certain price. Emily does have the obligation to buy these shares of ABC at the certain price if Oliver chooses to use his right to sell ABC’s shares. Oliver would only exercise his right if the stock price would decrease as he otherwise would sell the shares for less than they are worth in the open market. Emily on the other hand, hopes for an increase in ABC’s price. Let’s say you buy a call option on stock XYZ. When buying that call option, XYZ is trading at $100. You choose the strike price 105. A strike price of 105 means that you, as a call option owner have the right to buy 100* shares of XYZ at $105. Obviously, this is not worth it if XYZ’s price stays at $100 as $105 is a higher price than $100. But if XYZ’s price rises to $120, it would definitely be worth as you could buy 100* shares of XYZ for $105 (per share) instead of $120 (per share). When buying options, you will always have to choose a strike price. Most big and well-known assets will have plenty of strike prices to choose from. Depending on what strike price an option has, the option will be called differently. If the strike price of a call option is lower than the price of the underlying asset, the option will be considered In The Money (ITM). If the strike price of a call option is greater than the price of the underlying asset, the option will be considered Out of The Money (OTM). If the strike price of a put option is lower than the price of the underlying asset, the option will be considered Out of The Money (OTM). If the strike price of a put option is greater than the price of the underlying asset, the option will be considered In The Money (ITM). If the strike price of an option is close to the underlying asset’s price, it is considered At The Money (ATM). Of course, the prices of these options are adjusted according to their strike prices to avoid arbitrage opportunities. But more about that later. One significant difference between most other asset classes like stocks and options is the fact that options have an expiration date. You can’t just buy an option and hold on to it forever like you could with stocks. When opening an option position, you will have to choose a strike price and an expiration date. There are plenty of different expiration dates to choose from. You can trade options for the very short-term, the long-term and everything in between. For example, you could buy/sell options that expire in one or two days. Alternatively, you could open option positions in options that expire in a few years. 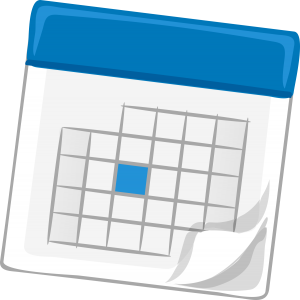 Different expiration cycles exist: quarterly, monthly, weekly… Usually, the monthly expiration cycles are the most popular ones. 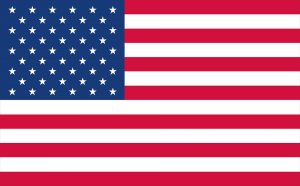 There are two different option styles: American and European. The names don’t have anything to do with the geographical locations meaning that American style options aren’t only traded in America and European options aren’t only traded in Europe. The only difference between these options is the time when they can be exercised (so when the right to buy/sell shares of the underlying can be used). American style options can be exercised whenever the option owner chooses to. European style options, however, can only be exercised on the expiration date. 1 Long Call 55 Jul 20 (Underlying: EFG): The 1 stands for the number of contracts. ‘Long’ means that this option is bought. Call indicates the option type. 55 is the strike price. ‘Jul 20’ indicates the expiration date (20th of July). Buying 1 contract of this option gives the owner the right to buy 100 shares of EFG at $55 before the end of the 20th of July. 3 Long Put 460 Apr 20 (Underlying: ABC): Buying 3 contracts of this option gives the owner the right to sell 300 shares of ABC for $460 before the end of the 20th of April. 10 Short Put 110 Sep 21 (Underlying XYZ): Selling 10 contracts of this put option, could lead to the obligation to buy 1000 shares of XYZ for $110. The seller of the option has to buy these shares for that price if the buyer of that option chooses to exercise his options. 1 Short Call 55 Jul 20 (Underlying: EFG): Selling 1 contract of this call option, potentially gives the seller the obligation to sell 100 shares of EFG for $55. This depends on what the buyer of this option does. If he exercises his option, the seller will have to sell the shares. The Option Chain is a table where everything I described above is displayed. Below, you can see a Nasdaq option chain for Apple. 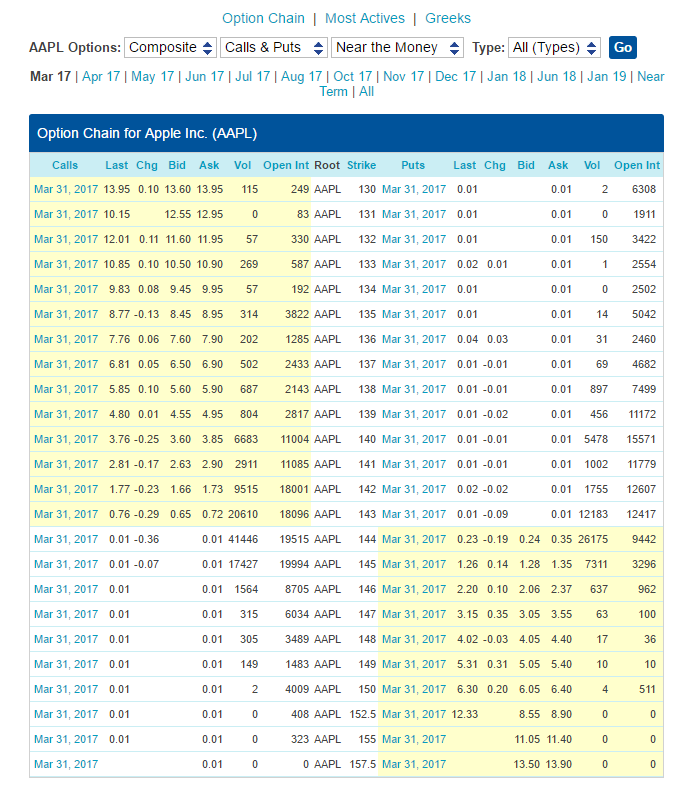 On the left-hand side, you can see all the call options and on the right-hand side, you can see the put options for the selected expiration date. On the top, you can see the selected and select other expiration dates. In the middle, you can see the strike prices next to the ticker symbol of Apple (AAPL). The color shift about half-way through indicates the ATM (nearest strike prices to the current price of Apple) options. Other typical displays for an option chain are the Open Interest, Volume, and Bid and Ask Price. If you don’t know what these measures are, don’t worry. We will be discussing this in a later lesson. Most option chains are fully customizable meaning that they can display whatever you want to have displayed (things like Greeks and Implied Volatility, but more on that later). Note that the prices of the options below all are under 14 $. This is the price for an option controlling one share of the underlying asset only. But options normally control 100 shares of the underlying asset. So you always have to multiply the price displayed on an option chain by 100 to get the ‘real’ price. I know that it can be very hard to grasp all the information at once. Most people first need some time to process everything. To help you do so, I created this short cheat sheet. I have summed up some of the basic options concepts on it. Back when I started to learn about options, I found this quite confusing and had trouble distinguishing the various option types. To download this helpful cheat sheet either click here or the picture below. 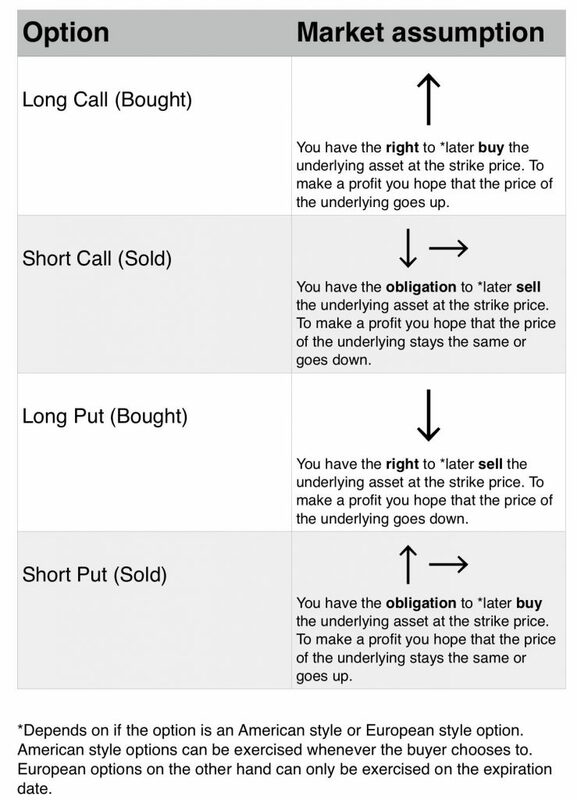 I really hope that this brief introduction to options could give you a basic understanding of options. If you have any questions regarding the information above or anything else, feel free to comment and ask questions below. Stock options, specifically calls and puts have always been something I have wanted to learn, but really haven’t had the time. Thanks for breaking it down in layman’s terms. It’s interesting that people can make money not only when the stock market is rising, but also when it’s falling. Is this a way for the average person to diversify a portfolio? Or is this better left to the professionals? So happy that you learned new things. Great introduction on stock options. I am looking for a way to put my savings to better use. I am getting a late start on my retirement plan and I have been thinking about stocks and stock options as a way to build a better financial path. Any recommendations on where to get more detailed info on this topic? Hey Brendon, I am very glad that you liked my introduction to options. Regarding more information about options you can just keep on reading some of my other articles on this site. I am updating and adding more educational content nearly everyday. Otherwise you can later check out my recommendations for other sites under the review tab. Good that you enjoyed the read. I hope you will enjoy my future content as well. Informative article Louis! I’m into stock investing and forex trading. I want to learn more about stock options. I will sign-up to your newsletter. I want some another regular stream of income like in my forex trading and stock dividends. Thank you! In there I will teach how to trade options for consistent income. Great article on the breakdown of options. I’ve always been confused by how they work, but this actually cleared up a lot of my questions. Just curious, it looks like there are options in pretty much any market out there including stocks which I know you’re talking about. I assume you recommend as a new trader that stocks are probably the best choice, but can you confirm? Great question! I actually have a complete article on that question. You should definitely check it out here. This is one of the best descriptions of options buying I have read. It’s a complex stock order to understand, but once its understood it can be so useful. I had an account that I used to trade options and did well when the US market fell through the early 2000s. At that point it was easy to see large trends such as the collapse of the luxury market and retail sector. Now I am into the cannabis market which is mostly penny stocks, but its good to know how to trade options. Just finished reading this page of option trading basics, and listening to the video, and it was great! You are doing a great job here, and you deserve at least a BIG THANKS! Currently I am selling Puts option only, keeping cash money in my margin account to cover myself in case the buyer will assign it, and I will have to buy the shares… I sold also once a “covered call”, which I was previously assigned. I don’t know much of strategies and I am not familiar with implied Volatility and other indicators which you are using. Looking forward to learn more deeply of Option trading, by reading and listening to what you have on your web site. Thanks again for all of what you do here, for free!! Thanks so much for the kind words! I really appreciate them. Hopefully, you will learn a lot. Just finished the Beginner Quiz. I guess Now I will have to start the “Intermediate Course – Pricing Greeks” – Is it correct? BTW – The quiz was not so easy for me. But I managed to pass it in first iteration. Congrats on the fast progress! You can view the course outline for the intermediate course here. The first article is the article on Greeks. Have fun learning and please let me know if there ever is anything that you don’t fully understand. Hi Louis, I am a long time trader (day trader) who has only been using securities up until now but I just start fast-trading options this last week and was very pleased with the results. I have a lot to learn and I just found your site, but I think I will be spending some time here this weekend soaking up what I can. Thanks for all the information. Right now I only have the right buy long calls and puts, and to sell covered calls of course. But I am starting to think you really need to be able to sell calls & puts to have really fool proof strategies with options. But I am not sure what a trader needs to qualify for selling naked puts & calls since the exposure is unlimited. It’s great to hear that you found my site and want to learn more about options. Being eligible to do more than just buy calls and puts is definitely something an options trader wants. The specific requirements may vary from broker to broker. So, I can’t tell you with complete certainty what the requirements are for your broker. Ideally, you should contact them to learn about all the details. However, I can definitely tell you how most brokers handle this. First of all, you need a margin account to sell naked options. You can not sell naked options in cash accounts. Most brokers have minimum deposit requirements for you to be able to trade on margin. A common minimum figure here is $2000. Besides that, a lot of brokers require you to answer some questions about your options trading knowledge. Based on your answers, they will evaluate your experience. So basically there they decide wether they think you can handle naked options or not. But note that there are countless options strategies that have defined risk and therefore, normally can be traded in most accounts. Even if your account isn’t eligible for naked options selling, you should be allowed to trade these defined risk options strategies. For instance, instead of selling a naked call that has undefined risk, you could sell a call and buy a call that has a higher strike price. This strategy would be similar to the naked call but it would have defined risk. This is just one of many examples. If you follow my training, you will learn more about this. Hopefully, my answer helps. If it doesn’t or if you have any follow-up questions, please let me know. Yes, that is a good answer. I don’t know the names of all the strategies yet, but I know about the one you just described. Thanks for the answer. I started trading a lot more options last week and I am sure I will have the hang of it before long. After I get more experience I will ask my broker to extend my selling privileges. The more I do it the easier it gets, and the more I know what to look for. For example, you said “take profits.” – I agree, with the IV it does not pay to sit in a position for too long. I have some experience with wide spreads, but I also found out my broker will trade options for me at “market” prices and I usually get filled at higher than the bid – so that is good (even if I submit a bid order they usually improve it some). I also learned a lesson about high-price high volatility options, and I got on the wrong side of them. That was not a fun experience. 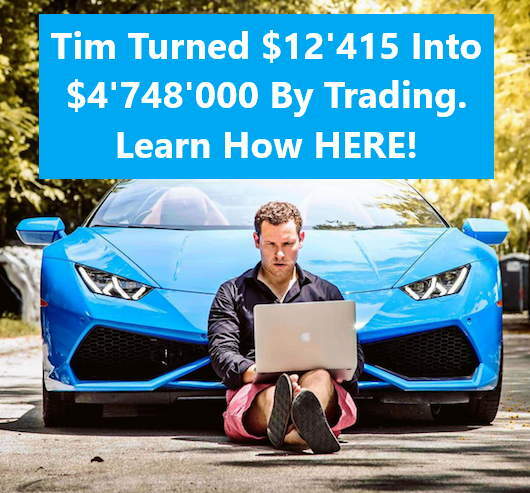 It seems as if that even with all the strategies – the hardest thing is not learning which strategy to apply, it is really just picking the best securities, times and prices to buy in. I am finding I can make more on very short term trades than on longer ones as long as I watch the momentum and take profits. Thanks for sharing your experiences. I really appreciate it. Options can be traded for the short term, for the long term and everything in between. One way isn’t necessarily better than the other. This just totally depends on personal preferences and on the strategy. If you prefer short term options trading and if you have found a good working strategy for that, then that’s great. Just make sure that you completely know what you are doing before you risk a lot of money. It seems to me that you are trading options very directionally (which is typical for short term strategies). It can be hard to predict very long term price movements. So that may be one reason why you are struggling with long term results. You might want to check out some non-directional strategies. These don’t necessarily require you to predict price movement correctly. But like I said, if you are having success with your trading style, then that is awesome. “He will have to sell shares of XYZ to Thomas”, I think you are wrong here, it has to be “He will have to sell shares of XYZ to Christian” to make sense, correct me if i misunderstand. Yep, you are absolutely right. Thanks a lot for pointing out the mistake. I just corrected it. Your website is amazing and looking forward to finishing all the lessons. Thank you for all the work and time you committed to the trading community. I have a question regarding one of your examples. 10 Short Put 110 Sep 21 (Underlying XYZ): Selling 10 contracts of this put option, could lead to the obligation to buy 1000 shares of XYZ for $110. The seller has to sell these shares for that price if the buyer of that option chooses to exercise his options. Would the seller not have to buy these shares if buyer exercises their right? You have… seller has to sell.